This is like the little black dress of cakes, although I think that technically it's more a quick bread than a cake. It's a French basic, typically taught by grandmothers to their grandkids. All measurements are done by volume, using a half-cup yogurt tub that is standard here. It's a nice change after you've cleaned up your bake and put the scales away. Tip the dry ingredients into the wet by thirds, mixing gently and making sure there are no bits of dry flour -- but don't work it so much that you get gluten development. Fill your baking vessels 3/4 - 7/8 full and bake. Bake time will depend on your add-ins, but I set the timer for 30 minutes, by which time the cupcakes are usually done. You want them to pass the clean-skewer test. Usually, if the kitchen starts smelling like dessert, it's time to check. * While the "original" recipe calls for AP flour, I use just about anything I have at hand, which usually means bread flour and anything that needs to be used up. I systematically swap out one tub of flour for almond meal or grated (unsweetened) coconut. And here, one tub of flour was swapped out for a tub of cocoa powder. ** 130g of starter (even discard, if it's not too old and funky) can be swapped in for the second tub of yogurt. 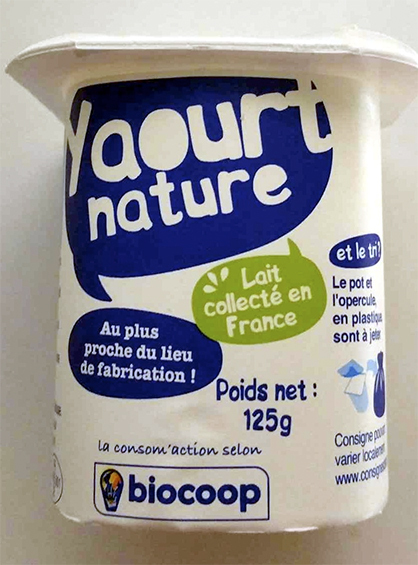 I've never tried this with a flavored yogurt, but if using grated coconut, a coconut-flavored yogurt could be fun. *** You're limited only by your imagination: dried, candied, fresh or frozen fruit (no need to thaw if frozen, but extend your bake time); any kinds of nuts, chocolate or butterscotch chips, cocoa nibs, citrus zest, candied ginger, cinnamon, nutmeg… I've even chopped up a tired-looking apple and tossed it in. Unfortunately, I don't seem to have made any notes of the fermented soaker bake. Pretty sure that I used my basic 70% hydration, white (with 10% whole wheat) loaf, 25% rye starter at 100% hydration. 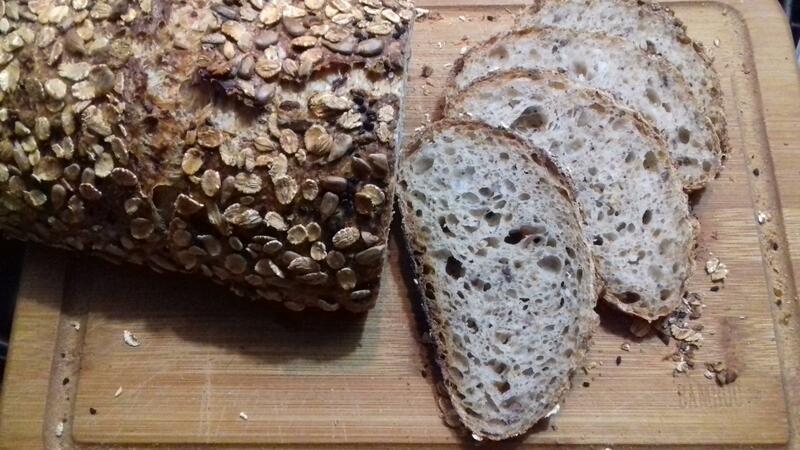 Probably about 150g of oat soaker at a 1:2 ratio, with a handful of seeds for good measure. Also sifted out 12g of bran from the whole wheat and added that with 9g of water to the soaker. I do have a vivid recollection of many, many SLAFs (CedarMountain, you could've warned me! ), trying to get the dough to come together. It finally did, just enough to liberate my hands, so I stuck the dough in the fridge overnight, hoping to firm it up a little. It did, sort of. But was still a very slack and tacky dough. 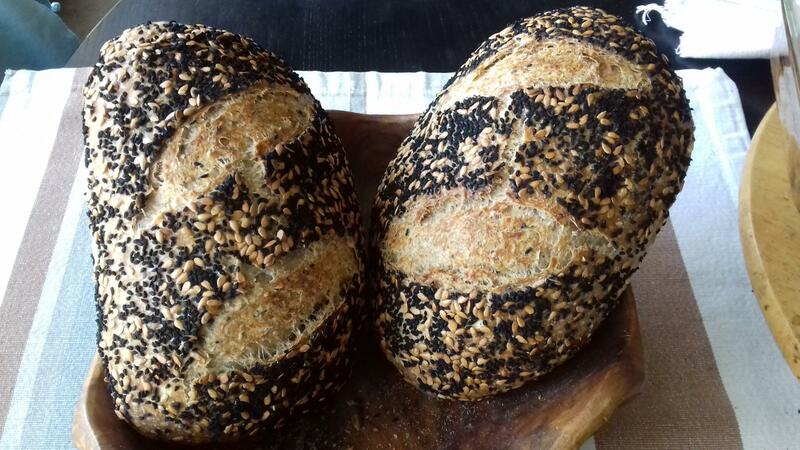 Pre-shaped as best I could, bench rested, shaped, coated with flax and nigella seeds and plopped into their baskets. They rose pretty well, albeit without ears. 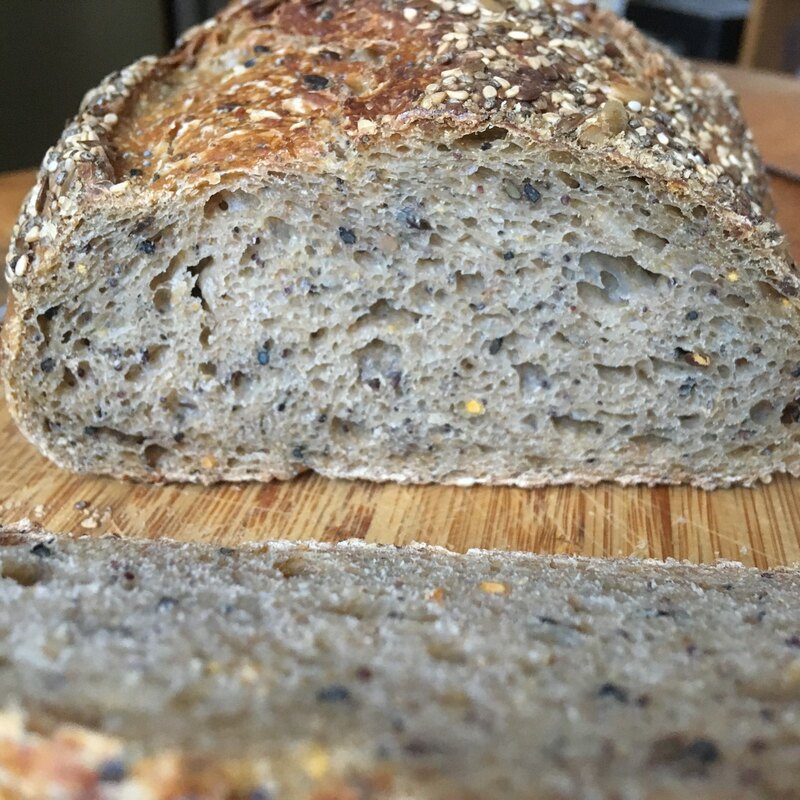 Crumb was soft (and stayed that way), crust was thin and crunchy, taste was mild and "wholesome" without feeling like it's supposed to be good for you. Obviously still need to work on my shaping! It looks like I baked these three days later, although have absolutely no recollection of the bread, except that I gave it away (but to whom?). 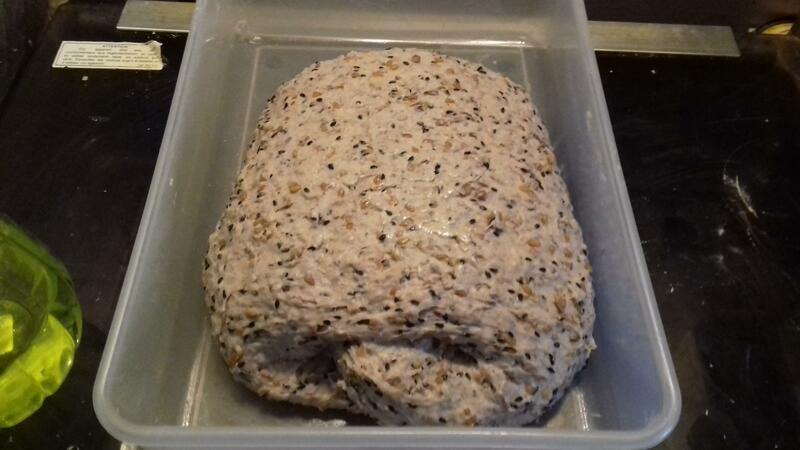 Instead of fermenting the soaker separately, I made up the oat soaker a few hours before adding 350g water and 20g rye starter to it, mixing that up and pouring it over 500g of flour (10% T150 whole wheat) and 10g of salt and let the whole thing ferment for about 12 hours at room temp. It's so rare that I make boules, I should remember who these were given to, but I'm drawing a total blank. But my big discovery was using sourdough instead of yogurt in my favorite yogurt cake recipe. This one got all kinds of things thrown at it: Swapped out half the flour for 25% cocoa powder and 25% ground almonds; replaced half the yogurt with 130g of starter, threw in some frozen cherries… it worked! Then there was a quick visit back to the Hamelman five-grain levain, cocktail-sized! 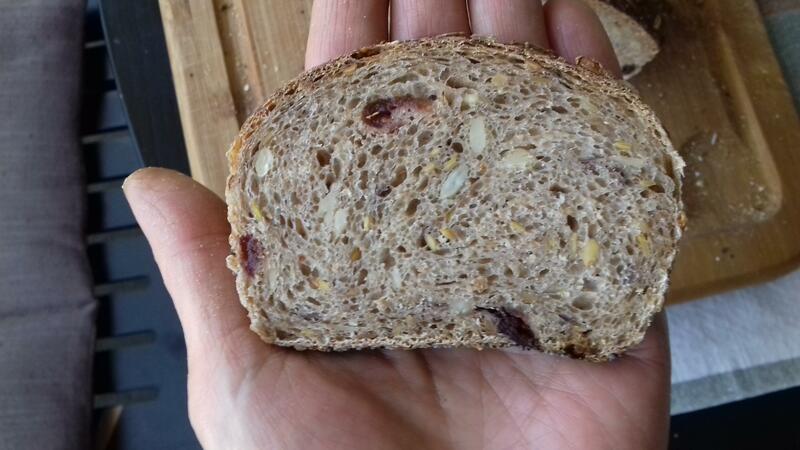 I tried an all-rye levain and it looks like I added a handful of cranberries. Love the taste of this one! 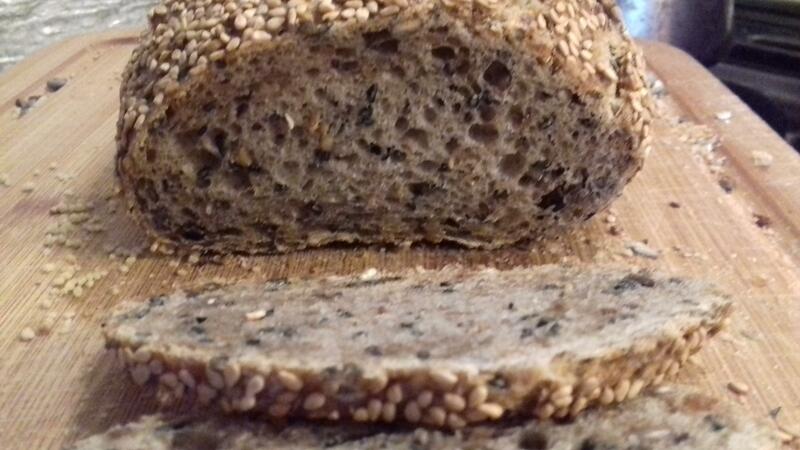 Having finally found a source for something called "dark rye", after so many months of being eager to try my hand (and taste buds) at a high-percentage rye bread, I was a bit disappointed to find that there were no "bits" in this supposedly whole-rye flour; the texture is desperately, uniformly fine. This leaves out something like the tourte de seigle, which specifically calls for T170 (in the French recipe), but perhaps gave me a little wiggle room for less-demanding recipes. 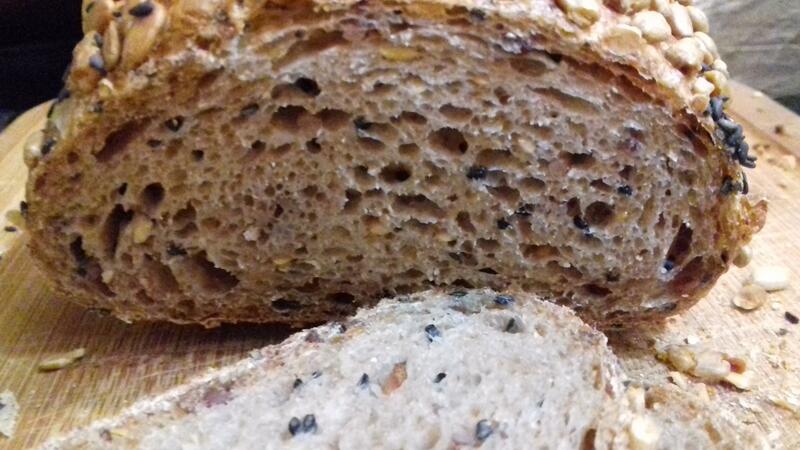 After scouring through the (too) many recipes bookmarked over the last year, I set my sights on Mark Sinclair's 100% rye for a number of reasons: he is extremely open as to what kind of rye flour is to be used; the levain is done in one stage and used fairly young; process sounded easy enough. And it was 100% rye; I figured if I was going to learn about the pitfalls of making rye bread, I might as well get my feet really wet. It all went surprisingly smoothly; the video of the process was a great help and most reassuring. Of course, I did, once the loaves were shaped and in their pans, send a panicked message to Mini, who very kindly held my hand through the rest. The baking loaves smelled absolutely wonderful. 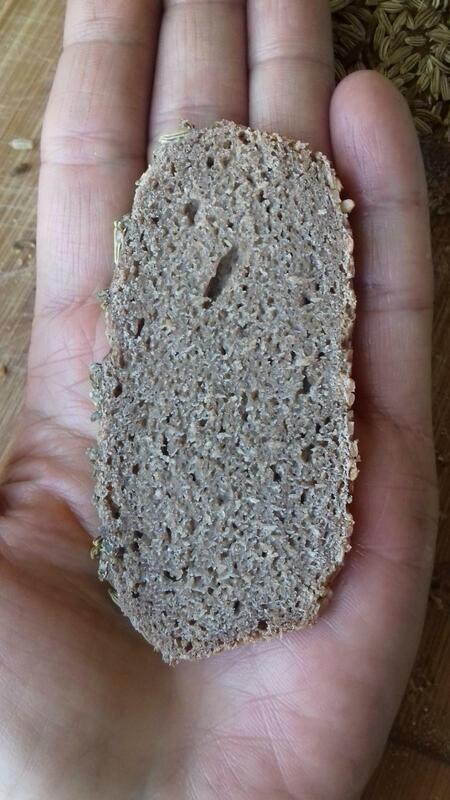 Taste and aroma are great, but I was disappointed in the crumb, which I found too dense and too uniform. I'm wondering if I should add more water, proof longer, or add seeds. Bitten by the rye bug, I decided next on Wally's 72% rye with soaker, figuring that the 28% of a wheat flour would give me the loft and some of the openness I'd found wanting in the previous bake. I don't have high-gluten flour, so just used my usual T65 bread flour. This was a very messy mix, and the first time in this year of baking bread that I thought wistfully about a mixer: I was up to my wrists in the stuff and wound up resorting to the Rubaud method to make sure all the ingredients were properly incorporated. This is indeed a pudding of a dough, that gets scraped/poured into its pan for proofing. Things went rather well, but for the fact that I got into trouble with the descending temps every 15 minutes, so the top and bottom got a bit burnt, but I'm quite happy with the crumb (lead photo) and the taste. Will definitely be doing this one again. And, darn it, my parchment got stuck -- that's never happened before. Just for good measure. Because I knew we were going to be out for most of the day, I mixed everything together and left it on the counter. I took a look at it when we got home and could probably have proceeded to shaping, but I needed to get dinner underway, so stuck the thing in the fridge until later on, then preshaped and bench rested. 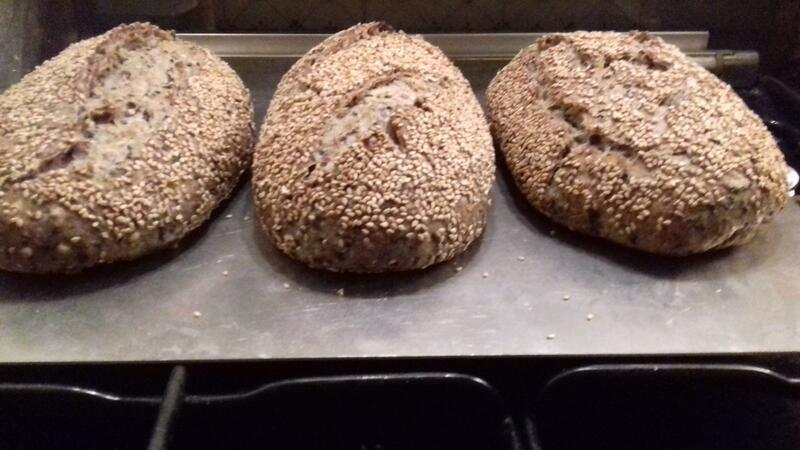 The shaping was a bit of a challenge, and I was afraid of frisbees, so I shaped as best I could, coated the loaves with seeds and plopped them into these Pani-bois baking forms, which I'd bought for the rye bakes. Now, what shall this week bring? As I mentioned previously, Abe taught me many months ago about do-nothing bread -- I think it was to help me get over (yet another) failed bake. This was ostensibly foolproof and painless. I believe it's based on Teresa Greenway's overnight sourdough, which in turn might have been based on Yoan Ferrant's do-nothing, 16-hour bread. In any case, Abe gave me an easy-to-remember formula, and I've used it faithfully for the occasional midweek bake, when running low on bread. I'd been afraid to tweak, fearing dire consequences of any variation during the course of the 12-14 hours of bulk ferment, although occasionally swapping in 10-20% of something other than white flour. 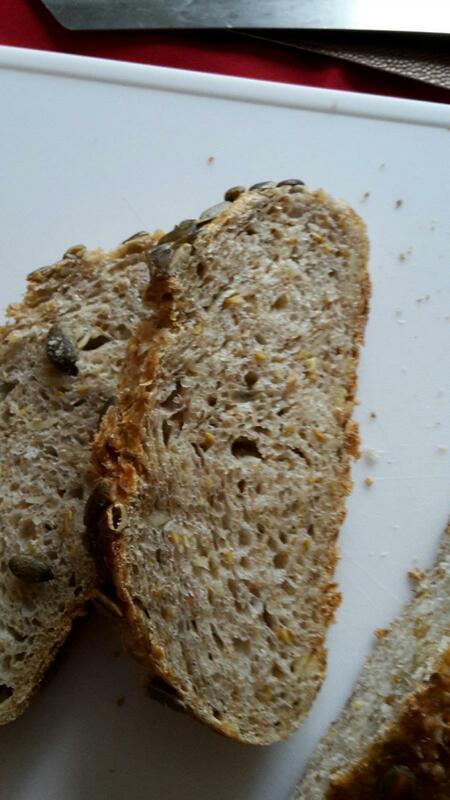 But last week, I did make two changes at the same time: swapped in 10% whole wheat, and added a handful of seeds. 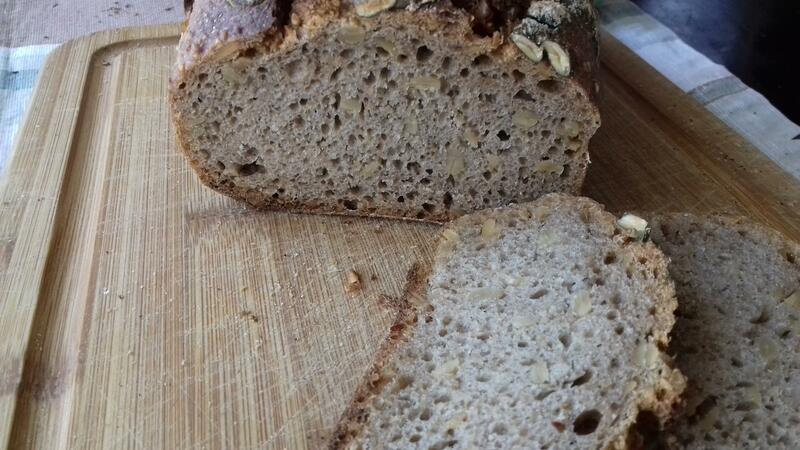 While the loaf lacked in loft, the crumb was good, although less flavorful than, say, the Hamelman 5-grain levain. But also much less hands-on. Having been recently converted to soakers, I'd wondered about, but was afraid of, adding a soaker into the mix. Wasn't sure what having the stuff ferment overnight in the dough would do. 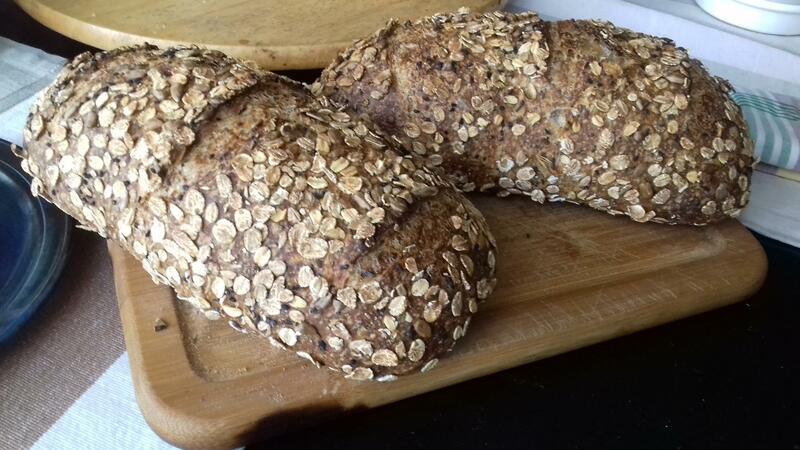 Then CedarMountain posted his fermented oat loaf. Well, if he could ferment his soaker overnight, how terrible would it be to add a soaker that would ferment with the dough? So I refreshed my starter and poured 100g of boiling water over 50g of rolled oats. When the fomer was nice and active and the latter had cooled, I took 20g of one and all of the other, mixed them up with 500g flour (T65 bread flour with 15% T150 whole wheat), 350g water and 10g NaCl, covered and left overnight on the counter, with one set of folds before going to bed about four hours after mixing. Very poofy, proofy, sticky dough the next morning. Turned it out onto the counter and gave it a couple of sets of letter folds about 30 minutes apart. By then the dough became workable and tacky, rather than sticky. And too slack for me to shape as tightly as I would have liked. 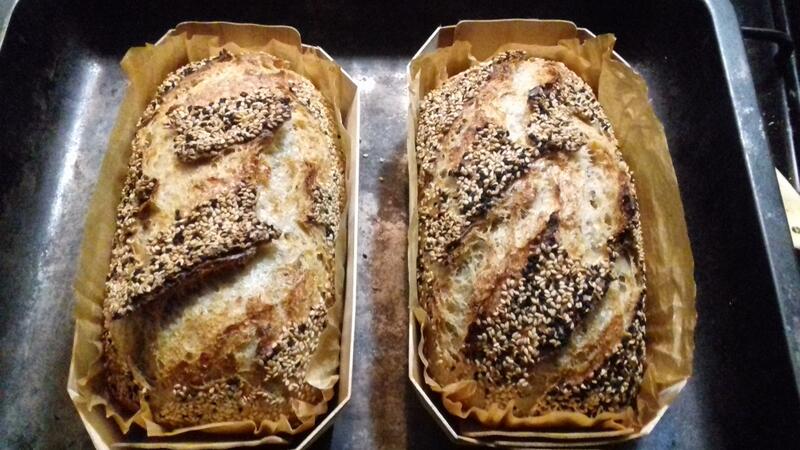 Gave the loaves a coating of nigella seeds and plopped them into baskets. A couple of hours later, preheated the oven, turned the loaves out into the roaster, spritzed, slashed, spritzed and baked covered for 20 minutes, then 20 minutes open. Like I said, I had trouble shaping these, but considering how slack the dough was, I'm pretty satisfied with them and will continue to work on shaping. It's been awhile, and this entry is more to try and keep track of what's been baked lately. After my third shot at the Hamelman five-grain, I went back to my usual formula, but adding the Hamelman-style hot soaker. 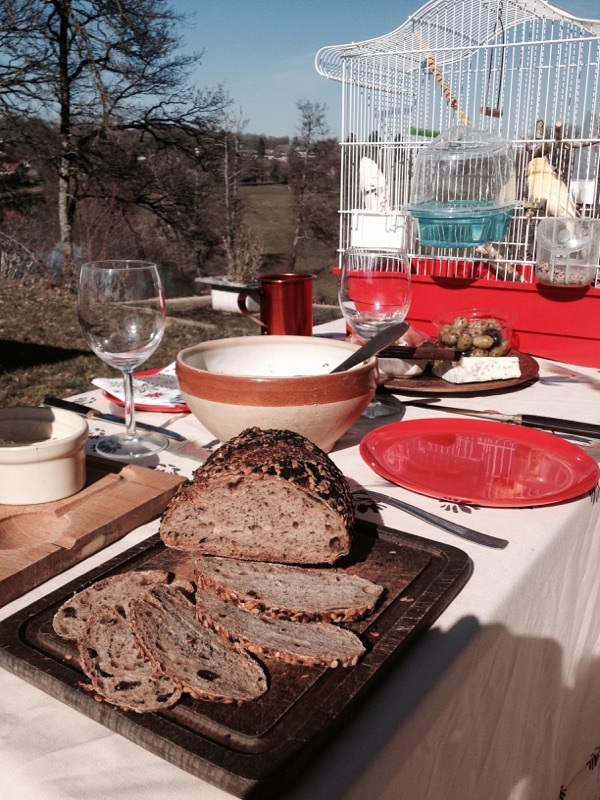 One of the loaves actually made it down to Burgundy, where spring had put in an early appearance, as in all of France that week. Finding myself with a batch of overcooked brown basmati rice, I decided to try adding some to my dough, along with a grain and seed soaker. And because it seemed a natural thing to do with basmati, I also grated in some fresh turmeric, which gave the dough a lovely color and interesting perfume. 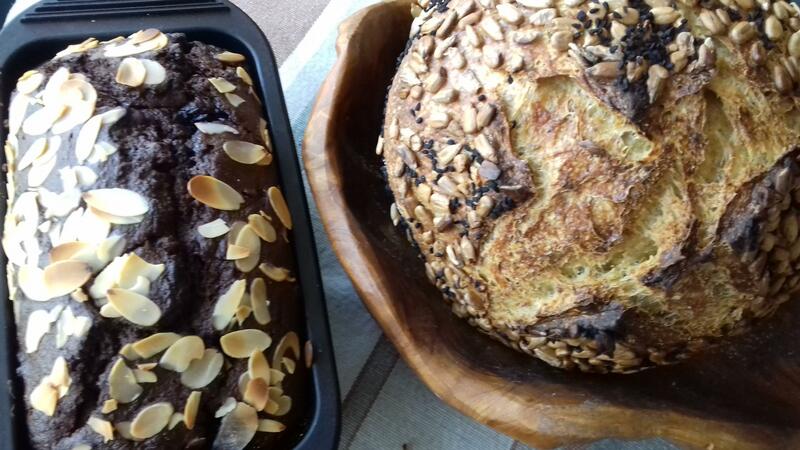 I made two loaves, but never got to taste any, since grandson was not only heading off to Brussels to see his girlfriend, but also down to Lyon to see his brother. He was kind enough to send a crumb shot and to describe the crumb as "dense, but voluptuous". So, thanks Ian! 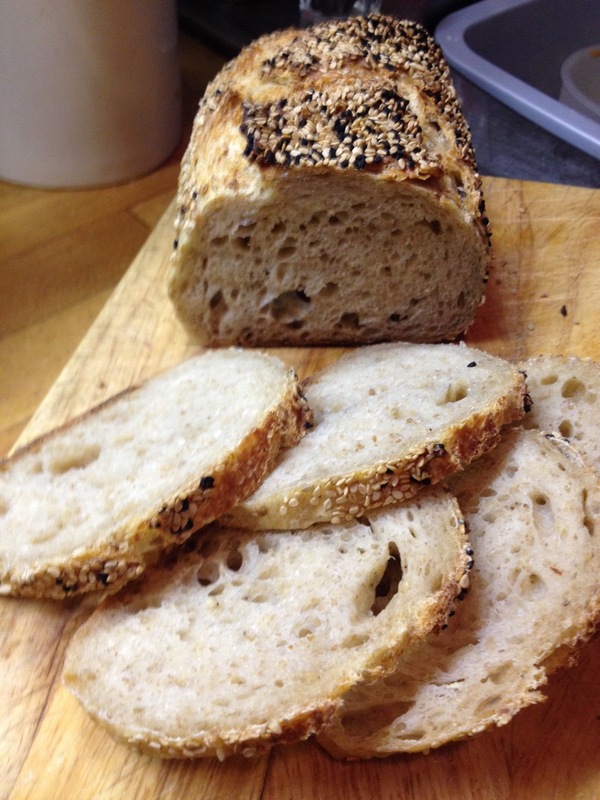 Many months ago, Abe taught me how to make a do-nothing bread, and it was one of those midweek, off-the-cuff bakes. I added a handful of seeds, but cannot for the life of me remember if I added a soaker. Probably not, since I was unsure of what would happen to it during the overnight, room-tempertaure bulk ferment. Which brings us to this weekend's bake. I was curious as to what a "young" levain would do, compared to the usual "mature" one, so I did the first build on bake day -2, and made the soaker in the same evening. Sifted the bran out of the whole wheat (came to about 12g), and added it to the soaker, with 9g of water (that I forgot to deduct the next day when making up the dough!). Bake day -1, built the second stage before heading to work, then stage 3 when I got home. Let that bubble up for about three hours, made the dough, mixed in the levain and let it sit for an hour or so. Then added the soaker, rice and salt. The dough felt lovely before adding in all of that stuff. Lots of pinching and folding before a long session of SLAFs. Two sets of STAFs half an hour apart, then into the fridge (about 3:30am) for an overnight snooze. On bake day, removed the dough from the fridge and let it warm up for about three hours, turned it out onto the counter and did a pre-shape, 45-minute bench rest and final shape. 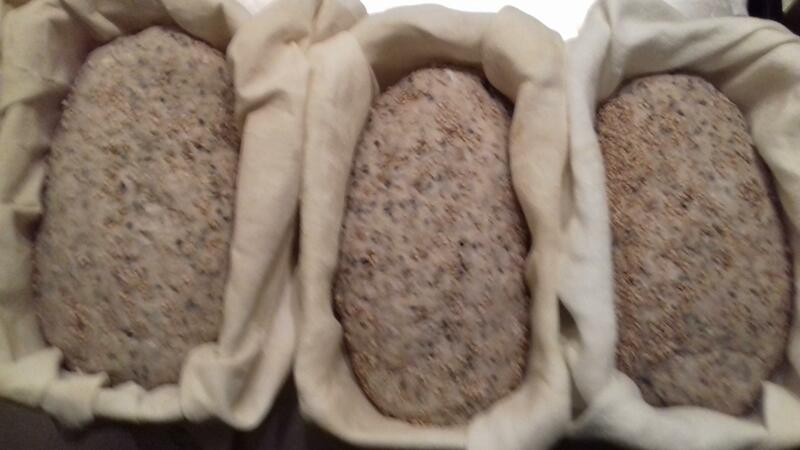 Coated the loaves in seeds and plunked them into their baskets. The dough had been quite cold, so I reckoned that the final proof was going to need some time. I did remember to stick a small lump of dough into a little container to keep an eye on the rise. In the meantime, made up the yogurt cake batter, then dithered about whether I should bake the cake first (which had the advantage of heating the oven partway and providing desert), or hold off on the cake until the bread was done, whenever that would be. Opted for the former. This batch made a dozen and a half of these little cupcakes; they were supposed to include toasted walnuts, too, but I ate them all while I was making the batter. And I simply forgot to sprinkle over spme flaked almonds or blond cane sugar… oh, well, we ate them anyway. 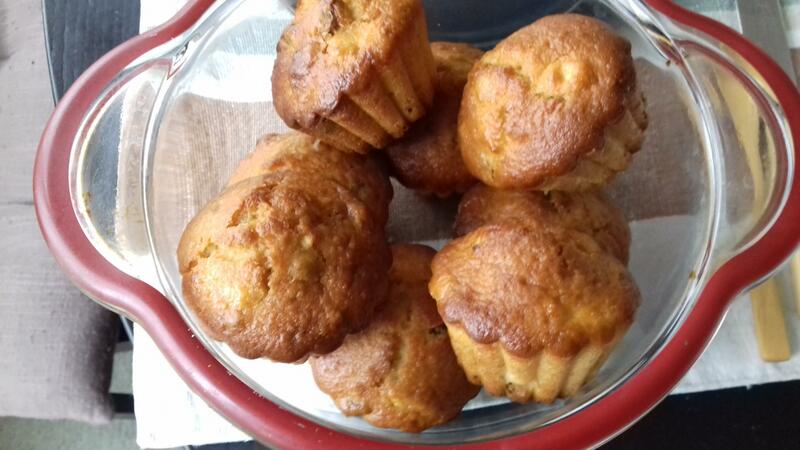 The sourdough added a nice flavor to these apple/prune yogurt cupcakes. The loaves finally went into the oven when the little lump of dough had risen by about 25%, I'll try going for longer the next time. The flavor of the rice really comes through, especially when the bread is toasted. 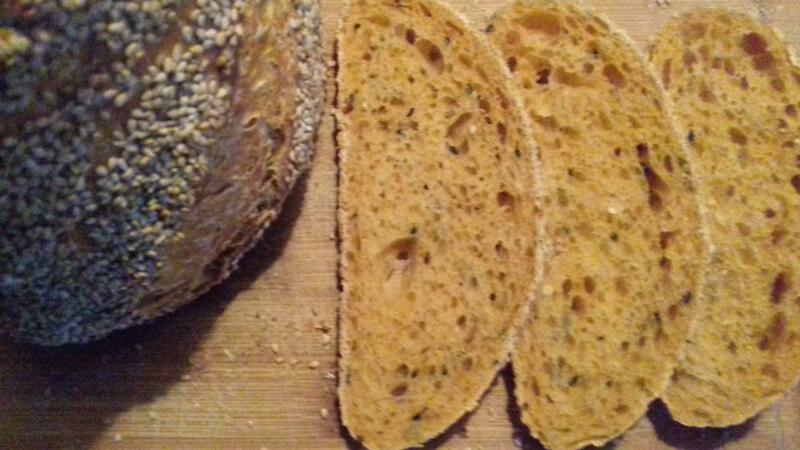 Crumb is soft and moist, crust is a little chewier than usual, but good. It'll be interesting to see the shelf-life of this loaf. One of the things I love about the soaker, aside from the flavors, is the fact that the crumb stays soft the whole week. Amazing. Next stop, CedarMountain's fermented oat soaker! a bit of starter to a "standard" hot-water soaker. I'll try to keep notes this time! Can anyone help me figure out the hydration of this loaf, based on the numbers above? I get all befuddled when there's a soaker involved. 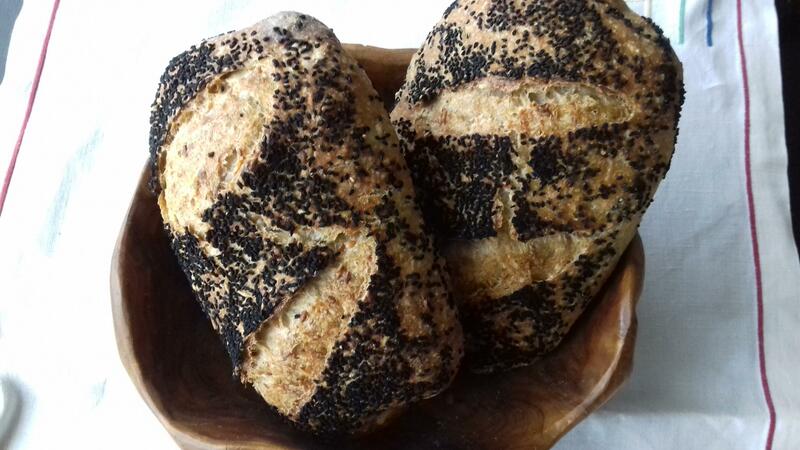 I have two sets of baskets, both of about equal width; one is about 24cm long, which works quite nicely for loaves of about 700-750g of dough, and a pair of smaller ones that work well with about 500-550g. These loaves were in the neighborhood of 630g and could have been smooshed into the smaller baskets, but I decided to give them room to grow and used the longer ones. Would proofing in the shorter baskets have forced the bread to rise higher once it hit the oven? Just realized: my starter is a year old this weekend! Thanks, Debra Wink! Having pretty much healed from a lost argument with my mandolin slicer, I decided it was time to make another attempt at the 5-grain loaf and put into practice the kind advice given by the great folks here. 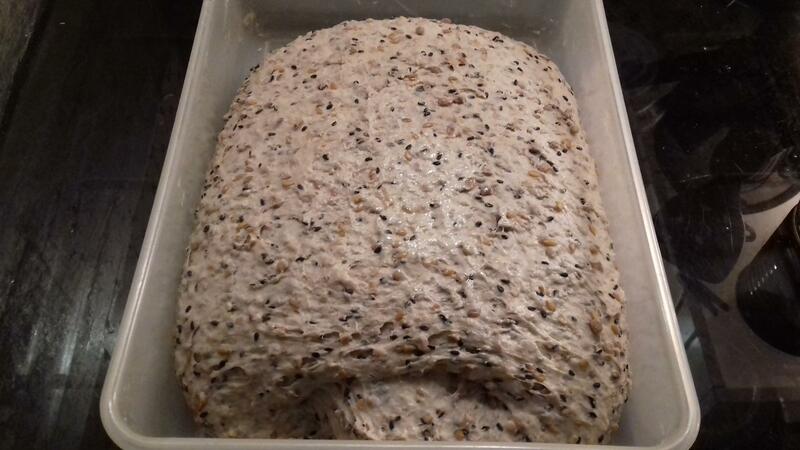 So built the 3-stage levain, made the soaker (toasted 5-grain flakes, flax, poppy and black sesame seeds), mixed the dough as per the recipe, first whisking together the dry ingredients in one bowl and the wet stuff in another, then added the dry to the wet. Per Dan's advice, gave the dough two sets of 150 SLAFs, adding a few grams more water to make the dough slappable. Over the course of the next 90 minutes, gave the dough two sets of letter folds on the bench. Retarded the dough overnight, then preshaped, rested and shaped loaves the next morning with sunflower-seed coatings before proofing in baskets for a couple of hours. 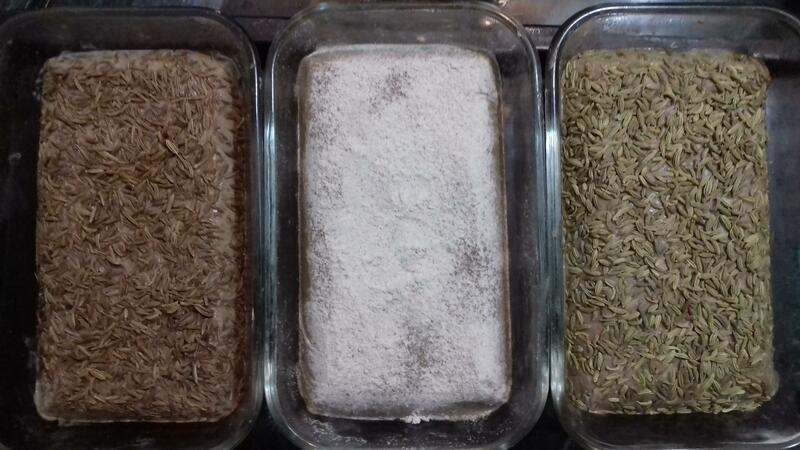 Placed the 3 loaves (about 450g each) in the roaster, spritzed, slashed and spritzed, then baked covered for 25 minutes and uncovered for 20. While I'm still a long way from the lacy, round slices that everyone else seems to have come up with, I'm pretty happy with the progress that's been made. I didn't get to taste these, they were given away, but have been assured that this is "great bread". Well, then it was time for a little douceur. I could make my usual yogurt cakes, or try Skibum's chocolate biscotti, for which he generously shared the recipe. It didn't take long to decide in favor of the double chocolate. 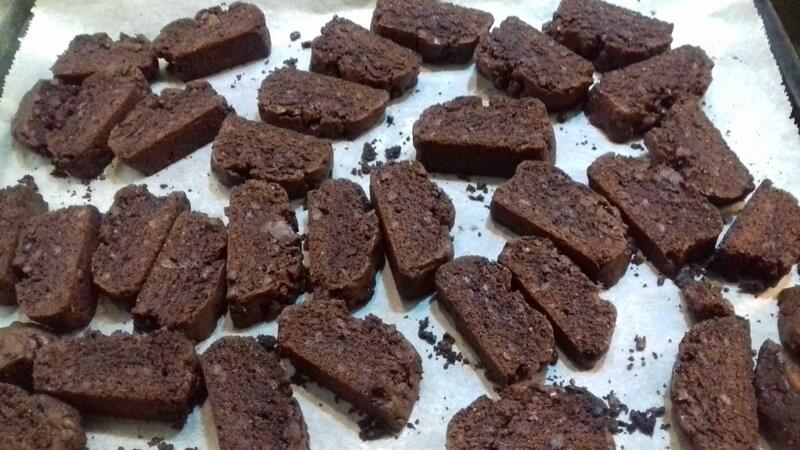 I swapped in a quarter-cup of chopped crystallized ginger with the chocolate chips; other than that, I followed the recipe as closely as I could (except that I didn't have an AP flour, so used half bread flour and half golden plain flour). Once again, whisked together the dry in one bowl and the wet stuff in another. Added the dry to the wet in thirds. Tossed the choco chips and ginger in the last third of the dry (the little bit of flour coating helps keep the add-ins from sinking to the bottom). The stuff felt like clay! I'd been wondering how I was going to shape a log, but it was pretty much the only thing that could be done with a dough that stiff. Ski says to form one 12x4 log, I opted for two 12x2. Easy peasy. And, boy, are they good! I can see that I already need to make another batch. Whew, time for something hands-off. 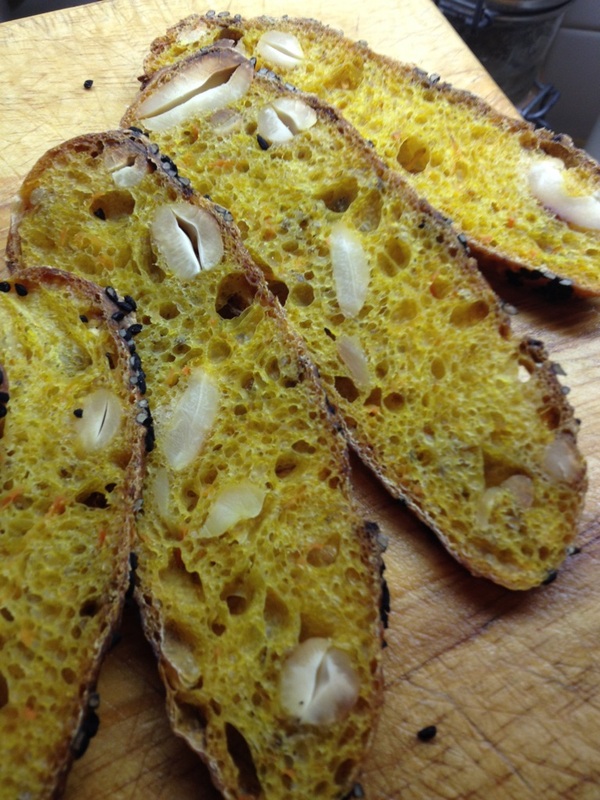 Shiao-Ping's cashew, carrot and turmeric bread was one of the first loaves I bookmarked when I discovered TFL. I've had the ingredients on hand for months, so finally decided to give it a go. Mixed up the 81% hydration dough per her recipe and let it sit. And sit. She's right: it was too tempting: one has to fight the overwhelming urge to scoop up the mass of soup and try to give a few good rounds of SLAFs. But it would have been a very messy procedure This was almost a batter, more than a dough. It smelled and looked lovely, so I just contented myself with a couple of letter folds about four hours into the bulk. Oddly enough, the pre-shape went quite well, but I found it too hard to get good tension on the final shape. 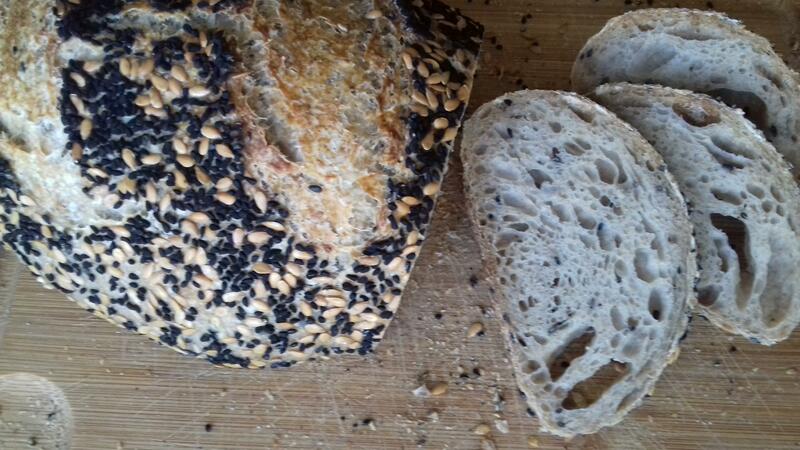 So wound up with a couple of flat loaves that have okay crumb and wonderful taste and texture. This was excellent toasted, with just a scraping of butter! 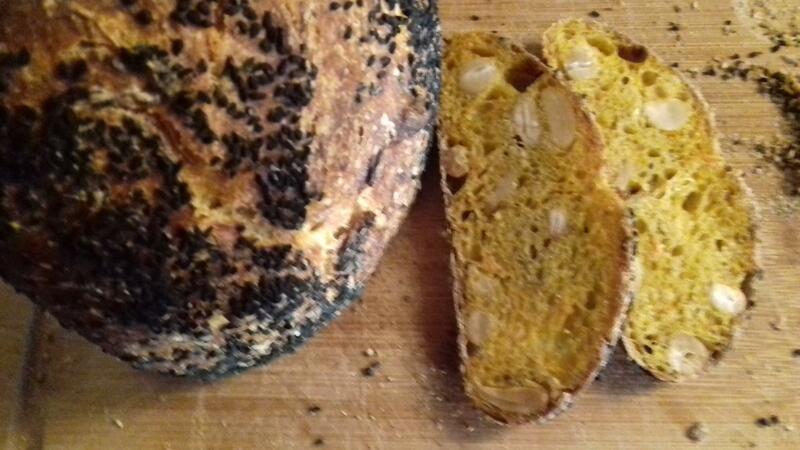 The nigella-seed coating works well with the turmeric and the cashews. Will be trying this one again, perhaps lowering the hydration a bit to get a more shapeable dough. Edit: There were, in fact, two things that differed from Shiao-Ping's recipe: I used fresh grated turmeric, rather than dried. And instead of freshly extracted carrot juice, I used some organic stuff out of a bottle. I was chagrined to read -- after mixing the dough -- that there was an added acidifier: lemon juice! Whether one or both of these had an impact on the dough's soupiness, I may never know. And an experiment in scoring. Having fallen in love with the taste of this loaf and avidly read all the accounts of the different experiences with this bake, I was ready to take another shot at it. Abe had suggested in passing that I try baking three loaves, each with different scoring. I decided this time, too, to try doing the whole procedure from mix to bake in the same day, rather than overnight retarding. mixed everything together, first using pincer and fold and gradually adding all the reserved water, then a few SLAFs. I let it sit out for another half hour, then tucked it into the fridge while we went to the movies. When we got home, this is what it looked like, so I removed it from the fridge to warm up for a bit while dinner was put together, eaten and cleared. 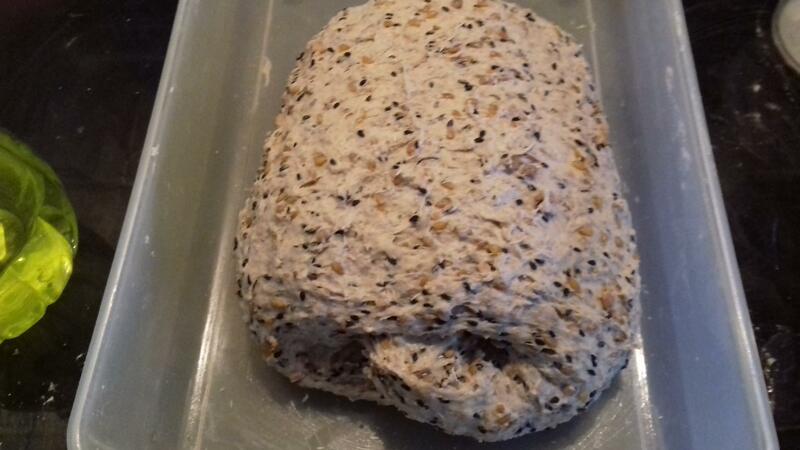 weighed and divided the dough, remembering to stick a little into my little jar (lead photo). In all, there is a difference of 5g between the heaviest and lightest round of dough, in the neighborhood of 450g apiece. 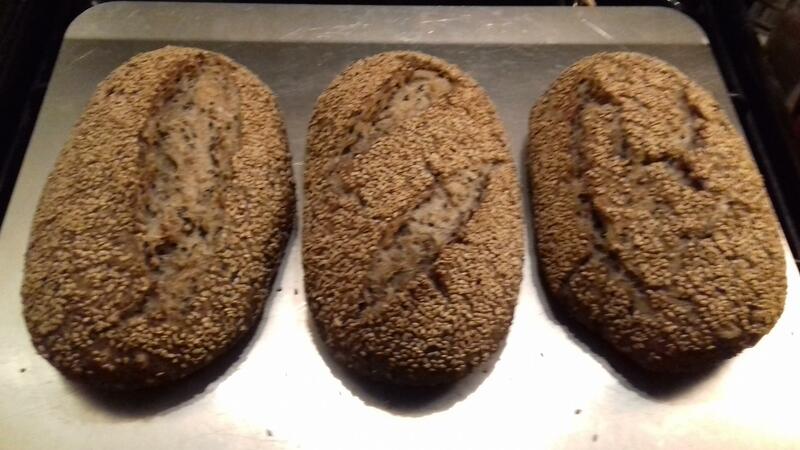 Bench rested about 40 minutes, then shaped into mini-batards and dipped in sesame seeds. Looks like a nursery, doesn't it? As you might be able to see, in the time that it took to place the other two loaves and score the top one, the single-score loaf had already begun to spread. So shaping needs further work to create more tension across the top of the loaf. Baked 25 minutes covered, 22 minutes uncovered. It's hard to tell from these bad photos, but the highest, roundest rise came from the double score, followed by the unscored one (far right). The single straight score definitely gave the lowest rise. BTW, these were looking a little anemic, so they got popped back into the oven. What is also interesting is that while they lost a bit of weight during baking (about 70g), the one that lost the least amount was the one in the middle. Now all I need to do is work some more on the shaping to get nice, round slices like Danny! Fortunately, I like the taste and crumb on this one. Shortly after taking these snaps, got into an argument with my mandoline slicer and won't be slapping or stretching or folding for a couple of days! Dan has organized another community extravaganza and already, there are some beautiful loaves posted. First build Thursday night; had lots of 100% hydration rye starter, so used that, which most certainly affected the finished loaves. Fed 12g at 1:2:2. Friday morning, realized that I was out of bulgur/buckwheat, which I'd meant to use in place of the cracked rye, which I can't find here (matter of fact, finding "cracked" anything is a bit of a challenge). So did the second build (1:1:1) and retarded it until I could get the marketing done. Made the soaker out of bulgur, flax and sunflower seeds and toasted multi-grain flakes (oat, barley, wheat, rye and rice). Didn't toast and/or grind any of the seeds. Measured out and whisked together flours and salt, measured out water (as usual, because of the difference between North American and French flours, 10% of the dough water was set aside), trying to organize a tidy mise en place. Did the final build of the levain (topping it up to get 340g of 125% BF levain). It was extremely soupy and a little nervous-making, despite what Alfanso's admonishments. After dinner, time to mix. Having read Dan mention wet dough and others talk about the diffiiculty of incorporating the soaker into the dough, I did something totally off the wall: dumped the soaker into the dry flour/salt mix, tossed that around and then added the levain, smooshed that around and then added the water. Dough was pretty stiff and I wound up adding, little by little, all of the reserved water. Tried to do SLAFs to make sure everything was well incorporated, but it felt like trying to slap and fold a roast beef. So resorted to pincering and folding as best I could, wetting my hands and bench all the while, because the dough felt really stiff. Over the course of the next two hours, did three or four STAFs on the bench -- dough was extremely stretchy but not at all elastic. Towards the end of the two hours, the dough began to feel almost workable, so into the fridge it went. The next day, got off to a later start than intended. 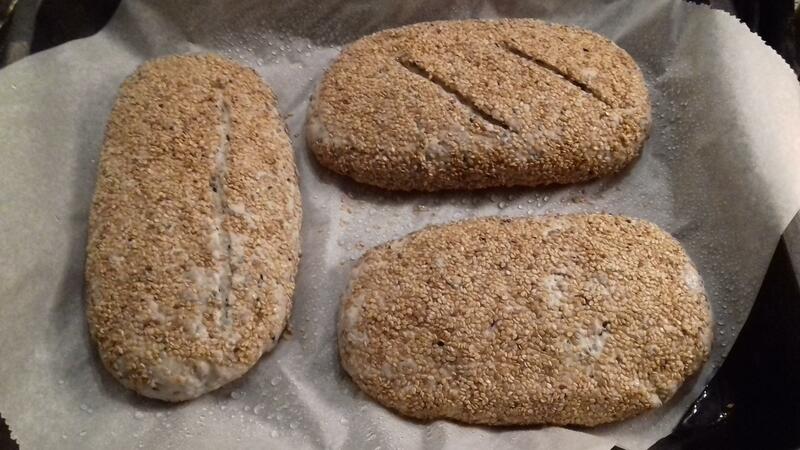 Took the dough out of the fridge to warm up for a couple of hours then did a pre-shape, bench rest and shape (the recipe doesn't mention the first two -- were we supposed to go straight to shaping?) I made one loaf slightly smaller (by 30g) than the other. I did remember to pull off a bit to put into a small jar to keep an eye on the rise. To keep life interesting, I decided to try a new technique for the pumpkin seed coating. Rather than go through the business of rolling the loaves on a wet towel and dipping the loaves in a plateful of seeds, I tried just mildly spritzing above -- not at -- the loaves (anyone who's seen a hairdresser with a can of laquer will know what I mean), then carefully picking up the loaf with both hands and lowering the wet side down onto the seeds that were simply sprinkled onto the bench. Worked quite well! Oddly enough, the loaves rose pretty well in their baskets, but the bit in the jar didn't, and I was beginning to get antsy because I had a bird to roast and was going to need the oven. In retrospect, I could have stuck the loaves back into the fridge until the bird was done, but didn't think to do so at the time. So I scored and baked. Same old demon with lack of rise, but Danni and Kat have since brought up the fact that extravagant rise with this many seeds wouldn't have been possible anyway. The smaller, double-scored loaf rose rounder and higher than the single-score brother. Once again, I can't say if it's the scoring or the shaping that would account for that difference. 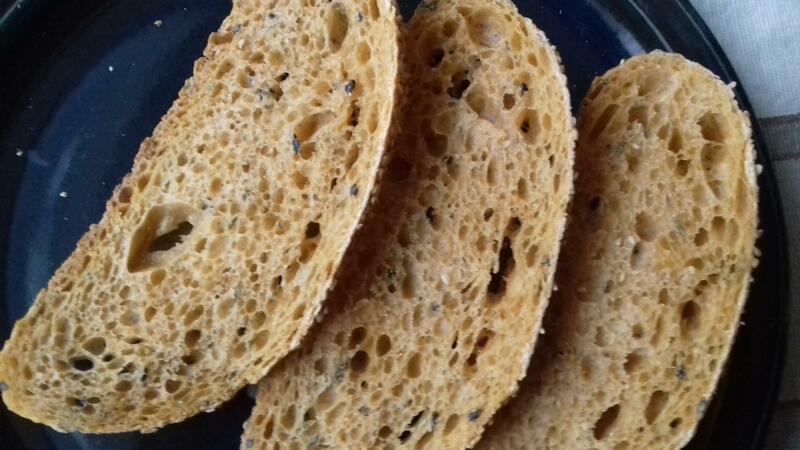 Crust is thin and crisp, crumb is moist and soft and absolutely tasty. So, will be taking another shot at this soon, perhaps doing the whole shebang in one day. This is such a great place, so glad to have found it. 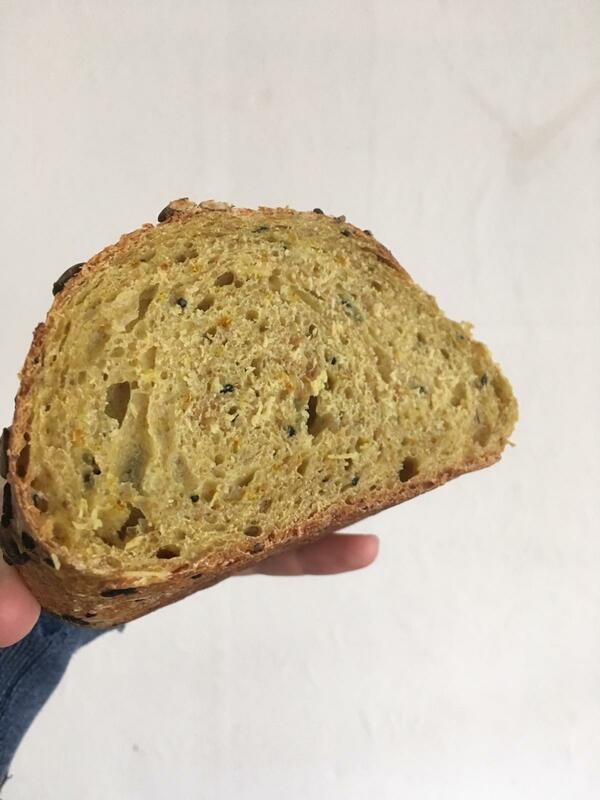 I'd mentioned to Abe that I was thinking of rosemary and onion for my next bake (working on shaping and scoring) and he came back with a suggestion for this lovely recipe for tomato bread by Emmanuel Hadjiandreou. The first surprising thing was the quantity of levain: 300g of 100% levain for 400g of flour! And since I wanted two 700g-ish loaves, I found myself building 450g of levain over the course of two days, after which I left it to retard in the fridge. 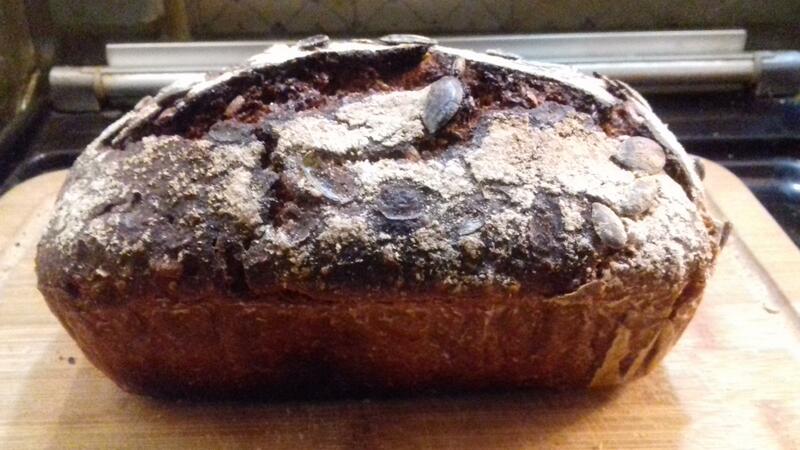 And a loaf with no whole grain (except the rye culture)? Eek. The next disconcerting thing was giving up my recently adopted "best" practices: adding a soake;, overnight cold bulk; preshape and bench rest. But Abe encouraged me to follow the recipe as written, at least the first time out, before I started in with my sometimes ill-advised tweaking. So I did. Most of the way. I did, however, have to cheat the bulk fermentation slightly. Being the star of time management that I am, I found myself in the position of either shortening the bulk by 15 minutes or letting it go until after dinner, which would have been way too long, unless I stuck the dough in the fridge early enough. Which I didn't, since the aim was to follow the recipe to the letter. Since there was neither pre-shape nor bench rest, the shaping of the slightly underfermented dough was a tad on the sticky side, but nothing unmanageable. Thanks to the "small, clear, straight-sided container" with a wad of dough in it, I did let the loaves proof longer thann I would have done if I were just relying on the poke test. Baked as per the recipe, and the kitchen smelled wonderful. I should also mention that the dough took on the most beautiful color from the tomato paste. Loaves are flatter than I hoped (so what else is new? ); whether that's due to the shortened bulk or the not-tight-enough shaping (or the relationship between them) will be tested out on the next bake. The taste is wonderful; we had it with some fresh goat cheese, and I just got home from work and ate a slice toasted, with nothing on it. 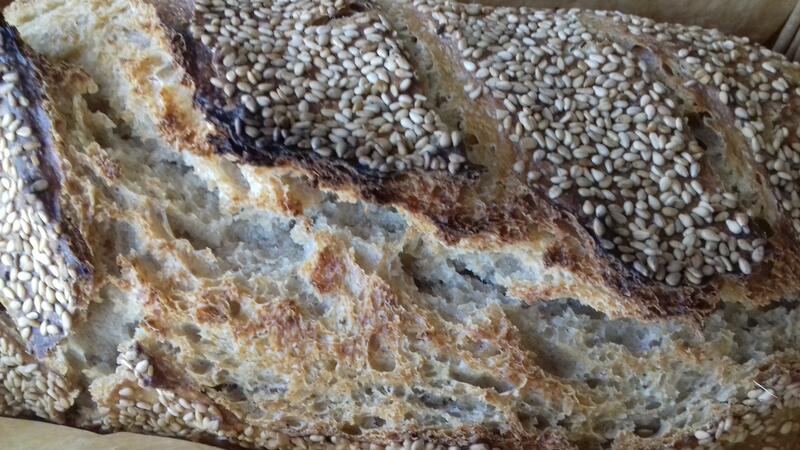 Crumb is soft, crust is crisp, color is so much fun to wake up to! I'll definitely make this one again, although I will want to ramp up the proportion of nigella seeds -- and do the pre-shape and bench rest. We did bake this one "together", and of course your loaf looks so much nicer, with that lovely round cross section and yummy crumb. Thanks again for pointing me in the direction of this loaf. Having successfully followed Abe's advice and restricted the cold retard to just the bulk fermentation, the next step seemed to figure out the best way to score for optimal rise/bloom/oven spring. 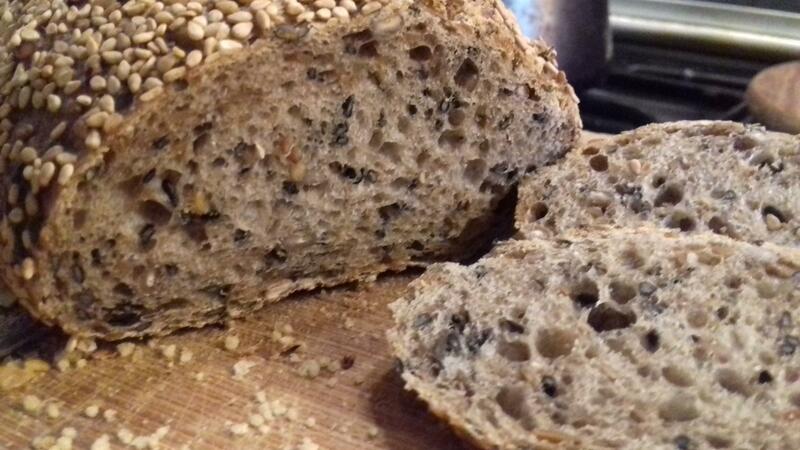 This was basically a rerun of the previous bake, except that the add-ins were ground dried clementine peel and poppy seeds, as well as the multi-grain scald. I started off by blowing the pre-shape, rolled them into logs, rather than boules, which was my intent. Anyway, what is it about the shaping on the first loaf that just doesn't seem to go right? I know I'm not supposed to, but the first batard didn't feel like it had enough tension, so I patted it back out and did it over. Having rectified my error, I let the two boules bench rest for 30 minutes. And, I finally remembered to hunt down a "small, clear, straight-sided container" so I could really try judge the final proof, rather than just winging it. I deliberately set it out on the bench before dividing and weighing so I would make sure to take some off and stuff it in the container. Well, obviously it was so clear, that I forgot it -- just didn't see it, didn't even remember until after I'd scored the loaves. Mmmph. Next time. I got the impression that the "letter-folded" loaves rose more uniformly than the "backward crossant" one, so this time I shaped both in the letter-fold fashion and scored them differently. So, the loaf on the left was the first one -- bungled pre-shape, twice-shaped and scored with two parallel cuts along the axis of the loaf. The second one was scored on the diagonal, possibly not as deeply as the first one -- I'm still having trouble judging the depth as I cut. Thoughtfully provided (with a little prompting from granny) by grandson. This is the loaf on the left, with bad pre-shape and wonky scores, but the cross-section looks okay to me. Crumb isn't too dense, for which I'm thankful.